It's beginning to look a lot like...Christmas? How did that happen? Well, it's almost the end of the year, but we still have a lot of 2017 home sales news coming up. Today, let's get in the Way Back Machine and look at the September and October numbers while we wait for the November numbers to come out. To the charts! Sales are back down from the stratosphere, but are still up year over year. Like WAY up. Inventory jumped a little in September, only to come back down in October. 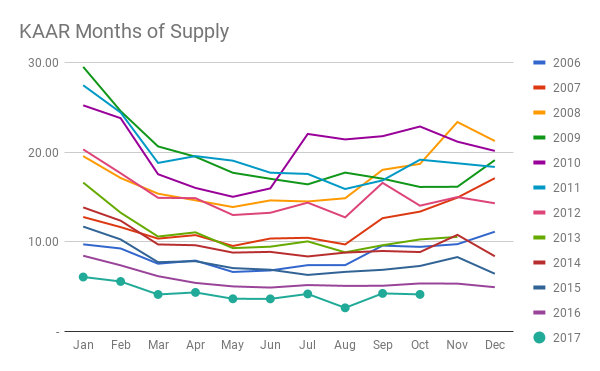 We are still at below normal housing stock levels, meaning it's still a seller's market. Rates are still around 4% and THDA money is still available in several Knoxville area zip codes (37914, 37917, 37912, 37921, and now 37920). That's $15,000 worth of grant money and a lot of multiple offer situations. Speaking of multiple offer situations... they are pretty much the new black. Also in this season: homes selling quickly, buyers paying at least full price, and sellers not being willing to do repairs. Homes in higher ranges aren't flying off the shelf as quickly as lower price homes. I say this to adjust expectations for sellers looking to list over $250,000. It's still a good market, but your days on market will be higher and your price might be a little lower, depending on your specific neighborhood. We are showing a lot of homes at night, in the dark, so that our clients don't miss out on any possible opportunities. Maybe leave us hot cocoa and cookies? It's gonna get cold out there soon. theAll information provided by KAAR (Knoxville Area Association of Realtors). My opinions are just that: opinions. I'm not really an expert in anything, but I do like to write about real estate.